Everdo relies heavily on keyboard shortcuts to achieve fast and low-friction user experience. You can also quickly activate command entry mode by pressing : on the keyboard. To apply an inline command, type it at the end of the item’s title and press Save or “Enter”. Once applied, the commands are removed from the title. Here’s a full list of all commands supported in the current app version. How far can Keyboard commands go? Everdo offers several ways get your data out of the app for analysis, reporting, backup or other reasons. 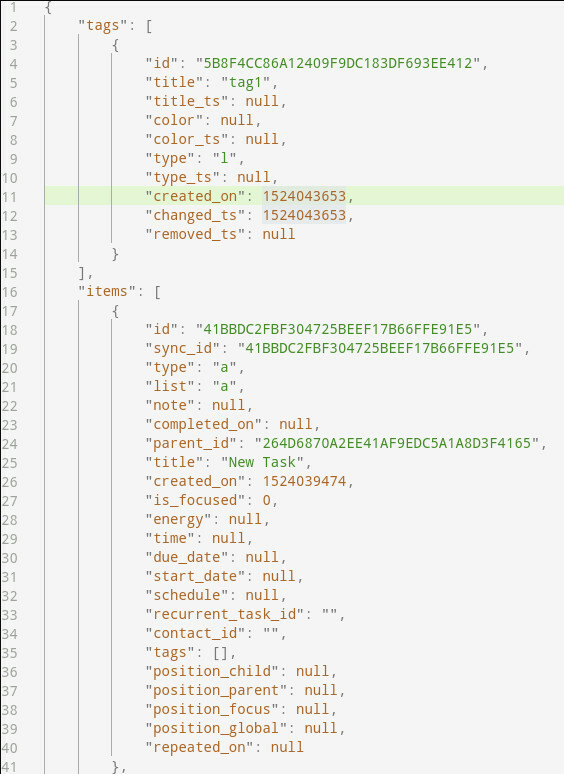 [ ] Try using "Export as CSV"
[ ] Try using "Export as JSON"
[x](Apr 2)  Use "Copy as Text"
JSON export allows to get the complete data in a machine-friendly format well suited for further automated processing. This feature allows to export all Everdo data in a standard format readable by Excel and other spreadsheet programs. Always use a copy, not the actual Everdo db file. Never modify the database file directly. It’s very easy to change data in such a way that will lead to Everdo crashing. You can copy the database file and use the copy to extract and analyze your data. 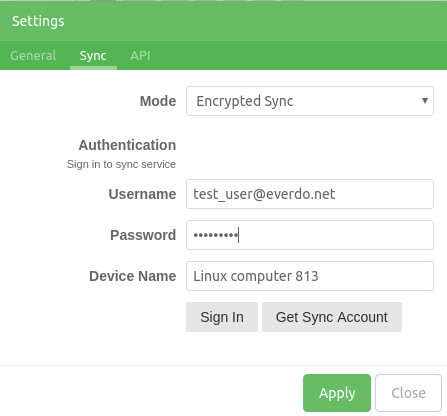 Encrypted Sync Service is the easiest way to sync your Everdo data between your devices. You don’t host the server yourself, which makes configuration easier and you don’t have to rely on a specific physical network for it to work smoothly. All text data transmitted for sync purposes gets client-side encrypted. The sync server never receives or stores clear text. Each of your devices needs to have the same encryption passphrase set up to be able to work with encrypted data. It’s highly recommended that you backup your Everdo database. Backing up is easy and is a good practice, especially when using beta functionality. 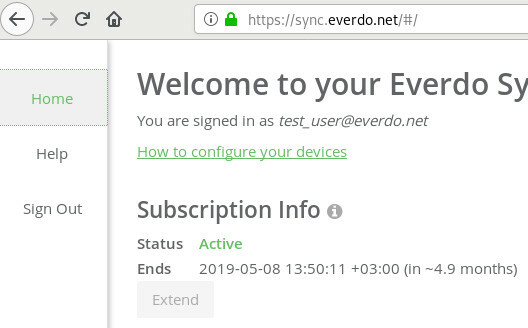 Make sure Everdo version is at least 1.2.0 on your computers and 0.76.2 on Android devices. Open Everdo on your computer and go to Settings (Ctrl+,). 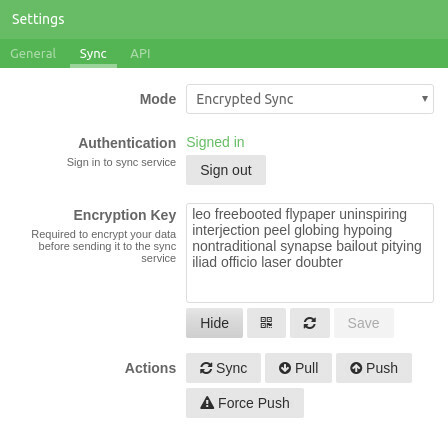 Open “Sync” tab select “Encrypted Sync”, then “Get Sync Account”. Important: at the end of setting up a device, don’t forget to click the Push button to ensure all existing items and tags from that device get added to ESS. Otherwise syncing may be incomplete, resulting in missing tags, projects and so on. Once signed in, a random 16-word passphrase will be generated for you to serve as an encryption key (see the image below). You can view the passphrase as text or QR code. It’s also possible to generate a new one. You don’t need to remember or even store this passphrase - you only need to transfer it to your other devices. If you would like to set your own passphrase, or transfer a passphrase from another device, you may edit the text field manually. If you choose to generate your own passphrase outside of Everdo, make sure that it contains 16 random English words from a large dictionary. You should now see the sync status updating at the bottom of the settings window. Important: now you need to click the Push button to ensure all existing items and tags from that device get added to ESS. Otherwise syncing may be incomplete, resulting in missing tags, projects and so on. Now press “Apply” to save the configuration and you are done. Once you have one computer configured, the rest is easy. To setup other computers follow the same instructions as in Step 2, only this time use the existing ESS account and encryption key instead of creating new ones. To setup an Android device, go to Everdo Settings on the phone and update the Sync Settings accordingly. You’ll need to sign in and specify the encryption key, same as you did on Desktop. When it comes to entering the encryption key, it might be easier to scan the QR code from the computer instead of entering the text manually. Don’t worry, you only need to do this once. After you’ve specified all the sync settings, go back to the app and swipe down to trigger sync and ensure it’s working. Once you see sync working, you can enable auto-sync in Settings. As mentioned before, each of your devices should be set up with the exact same encryption key. Otherwise they would not understand each other’s data and sync wouldn’t work. To make sure this requirement is met, ESS is capable of detecting when different devices are using different keys. In such scenario ESS will refuse to sync the device who’s key doesn’t match. This will be reflected as a warning in the sync settings dialog. There are several actions that you can manually trigger in the settings dialog if necessary to reconcile a data discrepancy between devices caused by a bug, changing sync settings and so on. Before using these actions it’s important to understand how they work to avoid unexpected results. First, let us understand how the automatic sync works. It’s important to understand that autosync is incremental, which means that your whole database is not being transmitted every time something changes. Instead, only the actual change get synced. This is why it’s important to Push data to ESS when transitioning from network sync - otherwise Everdo will only send incremental updates, while ESS still doesn’t have any existing data to apply the updates to! Push - this will copy all items and tags from the device L to ESS E, making ESS data after the push (E') completely match the local data. This action will completely discard the original ESS data. 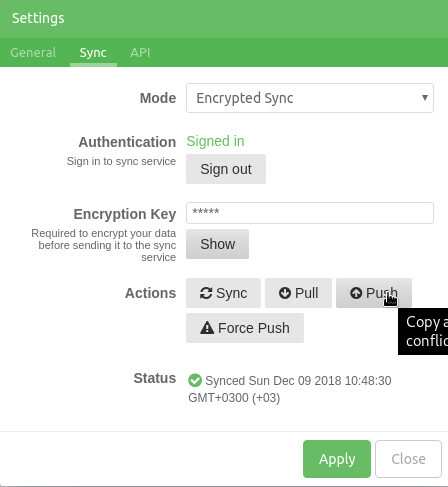 Force Push - same logic as push, but force ESS to accept data encrypted with a new key. This action will make other devices unable to sync until you configure them with the new encryption key. Pull - copy all items and tags from ESS to the local database, overwriting any conflicts. After the pull, the local data L' may be different from ESS because it can still contain items not previously synced to ESS. Clean Pull (1.2.7+) - import all items and tags from ESS (E) into an empty local database. This can be used to make the state on the device exactly identical to the ESS. WARNING: Items that have not been previously synced/pushed to ESS will be lost because the original local data L is discarded in favor of ESS data E.
Be careful when doing Clean Pull- there is a scenario when data loss is possible. If you used network sync before and then configured ESS, but forgot to make an initial Push, then making a Clean Pull will remove all your local data and import everything from ESS. But there may yet be no data in ESS! This is simply because incremental sync only sends incremental changes, so ESS doesn’t have all your old, previously synced data. Once I start using ESS, can I go back to network sync? Yes. It’s just a matter of re-configuring your devices. Which data gets encrypted and how? The titles and descriptions of items and tags are encrypted with AES256-CBC. A 16-word passphrase generated on your computer is used as the encryption key. The passphrase is stored on each synced device in order to work with the encrypted data (but not on ESS server). Each string gets encrypted separately for every sync attempt and gets it’s own IV. Is my data also stored in an encrypted form on my devices? No, the data on you devices is still in clear text. It’s only encrypted prior to being sent to ESS. Doesn’t make sense to store encrypted data on your own device since the key is stored in the same place anyway. What happens if I lose the encryption key? The encryption key is stored in a text file in the same directory as the database. If you lose it somehow, it’s not a huge problem, since the data is still in the clear on each of your devices. In this case you can simply generate a new key, update all devices to use it, then use the “Force Push” option to tell ESS to accept the new key, despite the mismatch. This means the device your are currently trying to sync uses a different encryption key compared to the one seen by ESS previously. You need to set the encryption keys to be exactly the same on all devices. To make a backup, copy the db file to another location. To restore a backup, replace the db file and restart Everdo. Alternatively, you could make a JSON export from within Everdo. Restore by importing the file. This way of backing up keeps your data safe, but it doesn’t preserve sync metadata. Setting a start date is meant to defer an action or a project, “hiding” it until a specific date. Once the start date is set, the item gets moved to Scheduled until the specified date comes. 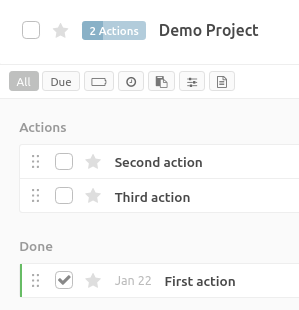 Once the start date arrives, Everdo automatically moves the action/project to Next and makes it focused (starred). But once the time comes to repeat the action, it gets copied to Next (not moved). The original action stays in Scheduled, unchanged. In other words, the scheduled item serves as a template for further repeating clones. Once a clone action is made, you can modify/complete/delete it, which will not affect the original (template) action. To stop the action from repeating, you’ll need to remove or archive the template scheduled action. A new clone action gets created every time according to the schedule specified in the original template action. To avoid confusion, please note that the concept of a due date in Everdo is completely separate from Scheduling/Repeating. In other words, you can have a Next action with or without a due date, or you can have a Scheduled action with or without a due date. You can even assign a due date to an item still in Inbox. The picture shows two focused actions, one of which has a due date set for today. This makes the action stand out, even in the Focus view. Each item in Everdo can be assigned a set of tags. When coming up with labels, make sure they are actually useful for you as filters later. Otherwise you’ll just spend time labeling everything for no benefit. You can transform an existing Label into an Area. Open the tag management window by pressing T, find the tag you would like to transform, then change it’s type to Area. As soon as you do this, the Area will be added to the area selector menu. If you name any tag so that it starts with “@”, The tag will also appear in the Contexts section of the navigation pane. This will make it more convenient to view the associated items and let you drag-and-drop items “into” the contexts. Any type of tag can be made a context by adding the “@” at the beginning - so for example you can have an Area tag that also appear in Contexts. To include items with a certain tag, left-click that tag in the filter bar. To exclude items with a certain tag, right-click that tag. For multiple selection hold Ctrl. The tag filters get combined by logical AND for example if you have selected tag1, tag2 and tag3 then you will get only the items which satisfy all three sub-filters. According to GTD, a project is an outcome or an objective. It’s different from an action in that a project typically can’t be completed “in one sitting” because it requires more planning and will likely involve multiple actions. An action, on the other hand, is something you can just start and finish when you get to it. The fastest way to create a project in Everdo is by pressing P.
The Next list (key 2) combines all actionable tasks from your active projects, so that you can pick your work from a single list instead of switching between projects. In a sequential project only the top action is considered actionable and gets added to the Next list. In a parallel project, all next actions will appear in the Next list. 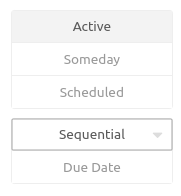 You can drag-and-drop actions within a project to specify the order in which sequential actions will appear in the Next list. Any item in Everdo can have a checklist as part of it’s description. You would still like to complete such action as a whole, at once, because the checklist items don’t make sense as separate actions. Creating a project works better when the sub-actions you need to take are distinct and self-sufficient. For example, you might do one action today and another one tomorrow. In this scenario a project is a better fit. 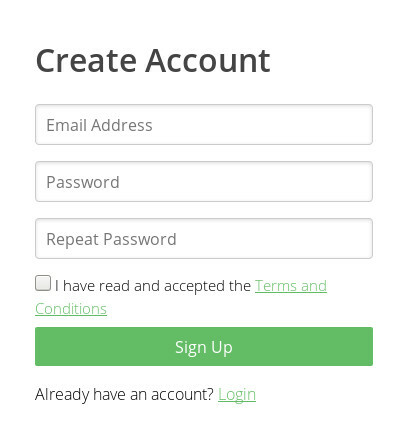 To convert an action into a project, simply drag it to the Projects navigation section. It will then appear as one of the projects. This is useful if you need to un-complete something quickly, or if you want to review what you’ve done. But at some point you’ll have hundreds of items in Done, which is not that useful. The purpose of the Archive feature is to hold completed items and projects forever, hiding them from Done. This reduces clutter and improves performance of the app on desktop and mobile devices. Archive all completed items by opening the Archive list and pressing “Move completed items to archive”. The default value is 90 days. This means that items archived over 3 months ago will not be loaded from the database. Consequently, you won’t be able to search for them or view them in the Archive list. Ninety days seems to work well most of the time, but you can modify this setting if needed (app reload required). There may be a performance benefit for using lower values, depending on the number of items you complete. Simply move the archived item to Next or Inbox to make it active again. Archived project actions remain visible in the Done list of the project. This is important to be able to see all the work that’s been done for the project. Archive days - what does this mean, and is unlimited archiving possible? Backup you database before trying to import manually edited JSON. You could break the app by importing incomplete data, and you might not even know something is wrong until sync stops working or some weird bugs appear. Make an export of your existing Everdo data to use it as an example while reading this document. This should help you understand the structure of the import objects and provide concrete examples. When creating new items via import, you have to generate a random universally unique id for each new item and tag. When there’s a collision, the import code silently overwrites the existing item. To avoid a collision, always use a random UUID (v4) generator when creating the import objects (unless you do want to update existing items). This is important. Other formats may cause issues. All timestamps are integers, representing Unix time in seconds (Unix format). Millisecond timestamps will not work. The .json file you’ll import must contain a single object with two array properties - tags and items. Each array may contain zero or more elements. Partial import works - you only need to specify the items you wish to add or update. Import does not delete missing items or tags. 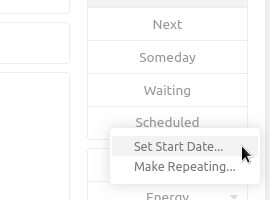 start_date or schedule for scheduled items. Some list values require specifying additional fields. For example in a scheduled item you also need to specify a start date. Completion timestamp (see Timestamps for format description). Null/undefined for incomplete items. Not null for completed items. Warning: True and False will not work. The timestamp’s time must be set to 0 Hours, 0 Minutes, 0 Seconds. For one-time scheduled items only. For repeating items only. This is a complex object. Try exporting some pre-scheduled items to get an idea how it works. The “template” action that was used to create an instance of this specific repeating action. Optional contact tag to wait for. The value is tag id. An array of tag ids. Don’t pass whole objects here, only string IDs. This document only covers the very basics of Everdo JSON format. If something you need is not covered, please PM me on this forum with specific questions.